The convener of Voice Against Corruption (VAC) JVP Central Committee Member Wasantha Samarasinghe states a powerful minister in the ‘yahapalana’ government had reportedly spent a sum of Rs 8 million through a corporation under his ministry to celebrate his birthday lavishly. Mr. Samarasinghe said the chairman of the Corporation is a close ally of the minister concerned and he also charged that the minister had deployed employees of the Corporation to work in the Minister’s house. Mr. Samarasinghe said the employees of the Corporation have been protesting against the Chairman for several months. The present ‘yahapalana’ government that came to power opposing Mahinda Rajapaksa regime for its frauds, corruption and misuse and waste of public money is continuing the same crimes committed by the ministers of the previous government and VAC would expose all such ministers and take necessary action against them said Mr. Samarasinghe. Important information is being revealed regarding the fraud committed by buying Greece government bonds with public funds during Mahinda Rajapaksa regime say reports. Information that has been revealed indicates that US$700 million had been used to buy Greece bonds. This is more than the amount reported earlier. The amount in Sri Lankan money is Rs.77,000 million. If this information is true Yahapalana government should take legal action against Ajith Nivard Cabraal, the Governor of Central Bank during Mahinda Rajapaksa regime, for inflicting a colossal loss to the country say financial analysts. Information regarding the investment of a large amount of money to buy bonds made when Greece was heading for economic ruin was first revealed by the JVP. The Leader of the JVP Anura Dissanayaka revealed and opposed the move in Parliament. 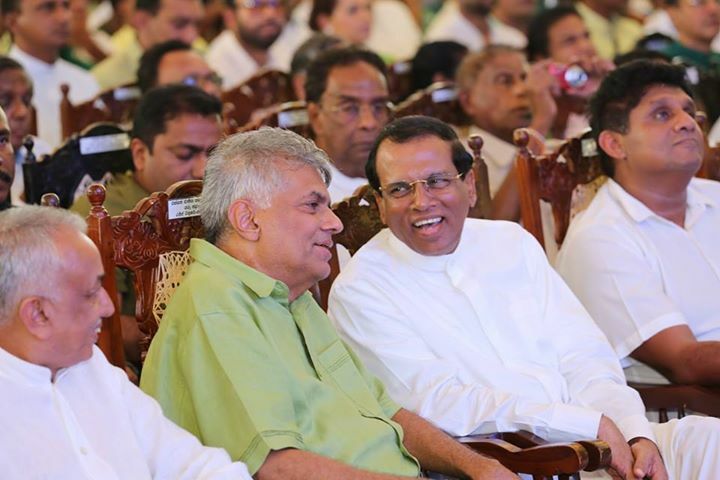 The internal clashes between the UNP and the SLFP ministers in ‘yahapalana’ government are spilling out at present say reports. An immediate example is the clash between the Minister of of Petroleum Resources Development Chandima Weerakkody and the Minister of Finance say sources. The Minister of Finance has increased the tax for fuel by Rs.10.00 without any discussion with Minister Weerakkody. Despite many in the government attempting to prevent the news of the clash from spilling out, Minister Chandima Weerakkody has opposed the move in public. Earlier a serious clash developed between Minister of Plantation Industries Navin Dissanayaka and the Minister of Finance regarding the move by the Minister of Finance to arbitrarily take over funds belonging to the Ministry of Plantation Industries. Minister Navin Dissanayaka opposing the move has said if the funds are taken over he would resign from his ministerial portfolio. While many UNP ministers oppose the Minister of Finance, several SLFP ministers too have expressed their opposition to the Finance Minister. Big onion farmers held an agitation blocking the Kandy – Jaffna A-9 road at Dambulla Economic Center yesterday (2nd) demanding a fair price for their produce. The agitation was organized with the participation of the National Organizer of All Ceylon Farmers’ Federation Namal Karunaratna and more than thousand big onion farmers in Dambulla area joined a protest march from Gam Udava Grounds to the venue to hold the agitation. The main grievance of the farmers is that their produce cannot be sold for a fair price due to import of big onions. Farmers say the ‘yahapalana’ government has not taken any measures to find a solution for the issue and demand Rs.100 per kilo for locally produced big onions. There is a shortage of 20,000 teachers in schools all over the island due to the absence of a systematic process of recruitment states the Minister of Education. It is also reported that the situation has further intensified as the transfer policy is not activated, a large number of teacher training colleges are inactive and also due to political interference in admissions for Colleges of Education. Despite there are 24 teacher training colleges in the country, 14 of them have been closed down and due to the teacher transfer scheme is not carried out the teachers take steps to remain or get appointments to schools in town which have more facilities worsening the situation. As the attention is for town schools with better facilities the fundamental right of getting education has been denied to many students and there is a severe teacher shortage in schools in difficult areas.